Get Me A Fresh Brain is quite a creative name for a great game. Players will have to both create their own monster with body parts and attack either other monsters or part of the town buildings. The game has a lot of pieces and will take a few minutes to learn how to play. Once you have everything figured out, you'll be glad you picked up this game. 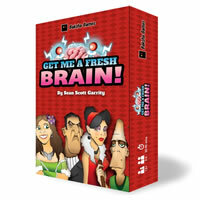 Taking slightly longer than most quick card games, Get Me A Fresh Brain will take close to an hour to play but will be enjoyable and challenging the whole time. Be sure to read through the game rules so you can understand all the ins and outs of this game. See how well you can do with this game and share it with your family. If you can destroy four buildings with your monsters or be the last monster standing then you will win the game. You'll get 6 turn summary/action summary cards, 28 character cards, 13 town/en route cards, 6 castle cards, 53 action cards, 28 character tokens, 18 character bases, 66 money tokens, 30 body part/supplies tokens, 1 die and the official Get Me A Fresh Brain game rules and instructions. Please keep in mind that the official Get Me A Fresh Brain dice-card rules and instructions could be different depending on the game version you have. The rules below are some of the exact directions on how to play Get Me A Fresh Brain. Share with us your comments, funny stories, tips, advice, strategies, creative ways to play, questions about how to play, problems with the rules or anything you want about Get Me A Fresh Brain. All submissions will be reviewed within 24 hours. Click here to add your Get Me A Fresh Brain comments. 1. Can the doctor pay for the carriage for an assistant to return home, or does the assistant need to be carrying that money? 2. When body parts are willingly dropped to pick up a different part, does the part remain where it is dropped or does to go to the morgue or does it disappear from the game?